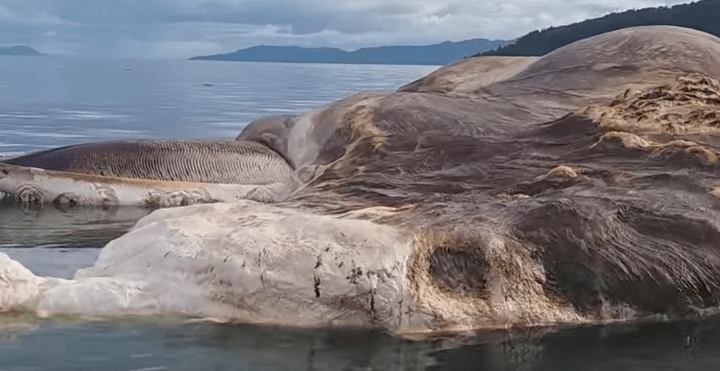 The carcass of a giant sea creature has washed up on the shores of Indonesia and no one knows what it is. A 15 meter-long sea unknown sea creature has been spotted in Maluku on the island of Seram in Indonesia. It is so big, the blood spilled from its corpse turned the waters red. It was first found by 37-year-old local, Asrul Taunakota, local Beritasatu.com reported. At first, witnesses believed it to have been a tipped-over boat, but quickly realized that it was the body of a sea creature. Soon enough, locals and tourists flocked to see the huge and mysterious beast. What was believed to have been a giant squid at first, was later thought to have been a giant dolphin. But apparently the beast was covered with fur, and dolphins don’t have fur. It is still unclear what the carcass belongs to. If you have any theories, please share them with us.